BHS successfully relaunched in the UK exclusively as an online retailer on 29th September 2016. They were able to do this by buying a new technology platform designed and built in under eight weeks. 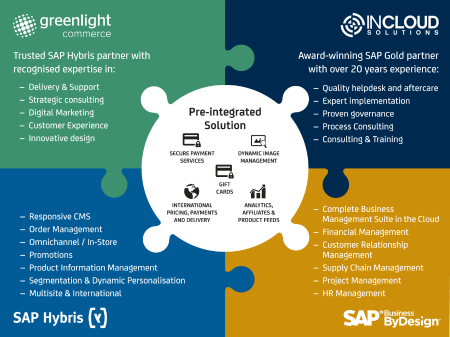 In Cloud Solutions and Greenlight Commerce worked in collaboration with BHS to design, configure and develop enterprise strength systems, using an agile approach and proven cloud technologies, including SAP Hybris and SAP Business ByDesign. Since launching, the retailer has quickly added to its portfolio with many new lines. Today’s consumer expects to shop anytime, anywhere, across multiple devices and receive a consistent and personalised experience at every touch point. If your digital commerce platform is not up to the task in any way, your costs will skyrocket while profits and customer loyalty plummet. In order to deliver on this seamless experience customers expect, different business systems need to be able to interact with each other. This can only be done by having a fully integrated digital business that has a single, real-time view across all channels and your supply chain. Greenlight Commerce and In Cloud Solutions have come together in a unique partnership to pre-integrate two essential platforms for the retail sector. We are both award-winning SAP partners who pride ourselves on our expertise built up over many years of implementing software as a service in SMEs. Combine this with two world-class, future-proof solutions developed by tech giants SAP and you have all the answers to your eCommerce needs. A single, integrated business application that effectively manages all your business functions puts you in the driving seat and allows you to compete with bigger rivals. Modern SMEs work better when they are agile and moving to the cloud means you no longer need a big, costly infrastructure. And with our pre-integration, you can get your eCommerce site up and running in record time. We know that one size does not always fit all, so we have the skill to adapt, implement and manage your technology so you can get back to the important work of growing your business. Combining Hybris and Business ByDesign allows you to focus on sales not technology Grow at your own pace confident that your solution will grow with you. Increase revenue through effective marketing, promotions, and cross-sell/up-sell opportunities. It is so easy to tap into SAP Hybris personalisation functions, including content, regionalisation, products, pricing and promotions. Offers retailers an enterprise-grade solution that combines commerce, ERP/Financial and CRM. Manage country, language, currency and channel from a single platform as you grow globally. Stay up-to-date with latest technologies and tools without IT maintenance overheads. Pre-integrated model makes it more cost-effective and faster to deploy than other products on the market. Cloud-based infrastructure reduces TCO, time and complexities, freeing you up to focus on innovation and strategy. Scalable solution built on market leading SAP software means you can be confident you’re getting true enterprise grade capability now and for the future. Flexible payment terms enable you to get the best solution now and pay later when you reap the rewards.